Our 7" Split Screen Mirror for Backup Cameras clips easily on your rearview mirror and is great for all drivers who need help backing up. Equipped with four video inputs for multiple cameras, game systems, or DVD players, our color, LCD mirror monitor is light and easy to use, with a split-screen mode or individual camera viewing modes. This 7" Split Screen Mirror for up to 4 Backup Cameras is compatible with all vehicles and all power sources, including cigarette lighters. Tadi Brother’s 7" Split Screen backup Mirror for up to 4 Backup Cameras clips to your car’s analog rearview mirror for prime visibility. No package is complete without multiple cameras. 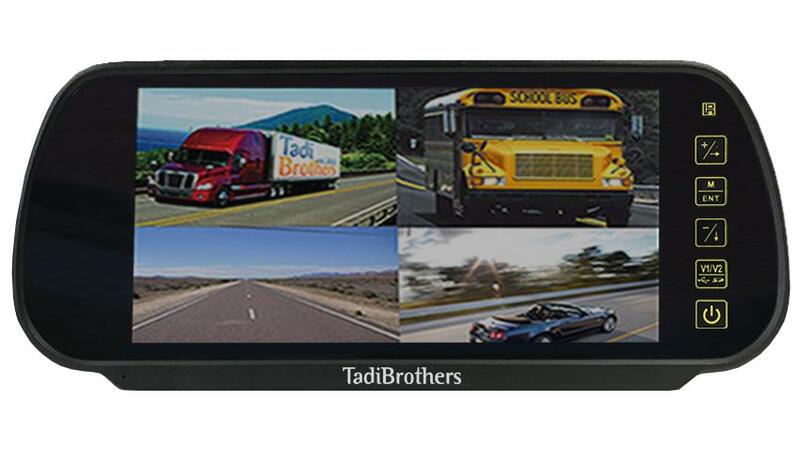 You can add up to four cameras with this 7" Split Screen Mirror for up to 4 Backup Cameras- all of which you can purchase Tadi Brothers. Mix up cameras, monitors, and DVD players for a unique viewing experience. If you drive an RV or other large vehicle, or need security cameras and monitors for a large vehicle, look no further. We offer many other models including 4-8 camera split-screen monitors. We also have extra-long cables for your extra-long vehicle. Tadi Brothers offers world-class products and we stand by them with a 24/7 technical team for any questions you may have. If you need to return your 7" Split Screen Mirror for up to 4 Backup Cameras, Tadi Brothers offers a 100% money back guarantee for 60 days.